Medical validatable rotary band heat sealer designed to seal medical packaging such as: Tyvek sterilization peelable pouches,Tyvek pouches for medical device packaging, medical grade paper, peelable pouches, header bags, foil laminate pouches. Medical validatable rotary band heat sealer - temperature, speed control and cooling bar pressure can be validated for medical GMP packaging requirements. Dual Element Thermocouple: For the temperature controller, and temperature verification, ports supplied. Quad digital temperature heat sealer controls maintain consistent heat. Heat is generated from rear and front heaters; or one set only using a simple on/off switch. Seals are made with special heavy duty wear-resistant laminated Teflon bands for the validatable medical rotary band heat sealer. Easy quick changeover and cleaning of the rotary band heat sealer Teflon Bands due to instant pressure release on bands. Uniform pressure on all sealing and cooling surfaces creates consistent quality validatable seals. Single line embossing code available, ink printing available. 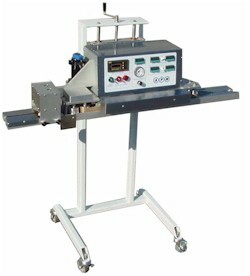 Medical rotary band heat sealer is mounted on a heavy duty floor model adjustable stand; can be ordered in the vertical or horizontal position. Chassis sealing assembly construction of stainless steel shafting throughout and anodized aluminum. Self contained compressed air, 110V, 1 Phase, 60 Cycle. No external air. Medical band sealer is designed with 10" long heating zone, and 10" long cooling zone; with temperatures up to 450 degrees +/-2 degrees Fahrenheit. Extra sealing capacity allows speeds up to 60' per minute with constant secure seals of 1/4" or 3/8" wide.